Our democracy is under digital attack. That concern is now raised before and after every major election. Newspaper headlines and social media feeds are full of stories of hacked documents, foreign troll networks, and bot-driven misinformation campaigns. Foreign actors, from states to extremist social movements, use these digital techniques to influence or undermine democratic processes. This issue has raised serious concerns among policymakers and citizens, but it is hard to get a grasp on what these digital threats are, how they work, and what might be done about them. 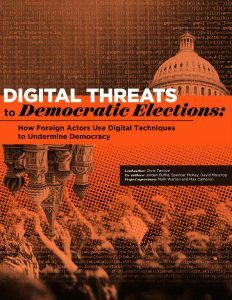 To address those questions, the Centre for the Study of Democratic Institutions is publishing an assessment of research on the topic: Digital Threats to Democratic Elections: How Foreign Actors Use Digital Techniques to Undermine Democracy. The report was written by researchers in UBC’s Department of Political Science, and our work was funded by a Knowledge Synthesis Grant from the Social Sciences and Humanities Research Council. Foreign actors employ four key digital techniques. The report details how foreign actors pursue hacking attacks on systems and databases; mass misinformation and propaganda campaigns; micro-targeted manipulation; and trolling operations. The threat of digital interference is not limited to its impact on electoral outcomes. Foreign actors using digital techniques can undermine three critical elements of democratic elections: fair opportunities for citizen participation, vibrant public deliberation, and effective rules and institutions. More research is needed to specify the effects of digital interference on these activities and on electoral outcomes. However, it’s clear that these digital techniques may affect some groups more than others, such as the troll networks that target women and minority groups with threatening and stigmatizing messages. State and non-state actors use these techniques, and often do so in ‘partnership’ with domestic actors. States have the resources to use these techniques at a large-scale, as made clear by analyses of Russian interference in the 2016 US elections. Digital techniques are also widely used by non-state actors, including terrorist groups, corporations, hacktivists, and extremist social movements. But foreign actors are not alone in using these digital techniques. Domestic actors use similar techniques, and act as de facto “partners” to amplify the interference by foreign actors. What makes countries vulnerable? We identify five key sources of vulnerability to digital interference: deficits in digital literacy; shortcomings in the design and policies of social media platforms; high levels of political polarization; and electoral regulations; and the lack of international laws and practices to address cyber-attacks and information operations. Countries differ in their vulnerabilities. There are many possible counter-measures to digital interference, but no proven solutions. Responses to digital interference range from increased fact-checking on social media to new electoral regulations to improve cyber-security of voting systems. We lack strong evidence about what works, but it is clear that action must be taken on multiple fronts. Foreign digital interference may contribute to vicious circles for democracy in Canada and other countries. Digital techniques can undermine democracy, such as by exacerbating social cleavages and weakening political institutions, and this in turn makes countries more vulnerable to future interference. If such vicious circles continue, democracy will decline. Policymakers, citizens, and researchers therefore need to take serious, timely, evidence-based action. We need to address digital interference as part of the larger project of making our democratic systems more resilient and responsive to citizens. Lead Author. Postdoctoral Research Fellow, UBC. MA student;  PhD Candidate;  Postdoctoral Researcher;  Professor and Merilees Chair in the Study of Democracy;  Professor and Director of the Centre for the Study of Democratic Institutions. Chris Tenove, “The Digital Attack on Democracy“. Policy Options. January 18, 2018. Spencer McKay, “Fake news is still making headlines: but we’re learning more about how online misinformation works“. Blog post, UBC Centre for the Study of Democratic Institutions. January 18, 2018. Chris Tenove. On the Coast, CBC Radio. Starts at 2:22:40. January 18, 2018. Metro News. Troll networks threaten the 2019 Canadian federal election. January 22, 2018. Stewart Prest & Chris Tenove. How to protect Canadian democracy in 2018. Ottawa Citizen. January 29, 2018. Heidi Tworek, “Responsible Reporting in an Age of Irresponsible Information.” Alliance for Securing Democracy. The German Marshall Fund of the United States. Policy Brief No. 009. 2018. Chris Tenove and Heidi Tworek, “What Europe can teach Canada about protecting democracy“. The Conversation. April 5, 2018. Public Policy Forum in Ottawa: Breaking the News. May 14th, 2018.